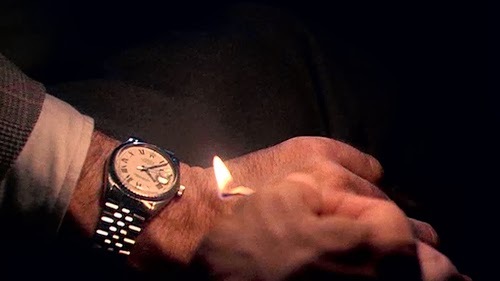 Experimental musician and appropriation filmmaker Christian Marclay's masterpiece The Clock is a 24 hour looped video work. The piece is composed of thousands of appropriated film clips featuring references to the time - sometimes incidental (someone passing a clock, or a incidental shot through of one through a window), sometimes direct (someone looking at a watch, or referring verbally to the time). The film runs in real-time, acting, as the title suggests, as a clock. The clips cycle through rapidly, eliciting a cascade of recognitions and associations in the viewer. The film becomes a meditation on time, cinema and the images that form the collective conscious. Building on previous works such as Telephones (1995) and Video Quartet (2002), Marclay's work is a tour-de-force of video editing, constructed with a team of assistants of researchers. Since Marclay began working in this way we have seen the advent of YouTube and the rise of easily-available digital video. Coupled with this, the increased accessibility of video-editing software has made montage film-making in the manner of Marclay's early work a trope most often executed by bedroom editors generatnig amusing web content. Marclay stages the trope on an epic and spectacular scale, with a poetic elegance that mesmerizes and enthralls. Winner of the Golden Lion award at the 2011 Venice Biennale, numerous 24 hour screenings have been staged when it has been shown.